Millennials watching Peanut's A Charlie Brown Thanksgiving for the first time have branded the holiday favorite as racist. The classic animated special was broadcast on the national holiday, but many claimed that they were left feeling uneasy about how one of the characters was treated. The episode, which airs annually on ABC, features a holiday meal shared between the characters, after Peppermint Patty invites herself and others to Charlie Brown and Sally's house. Although they are planning on heading to their grandmother's house for Thanksgiving dinner, Linus convinces Charlie they have time for two feasts. 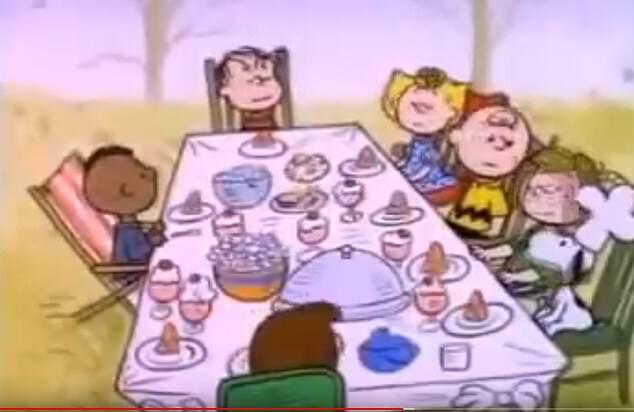 But viewers suggested that the fact Franklin, the only black character in the show, is sat by himself on one side of the table by himself is discriminatory. 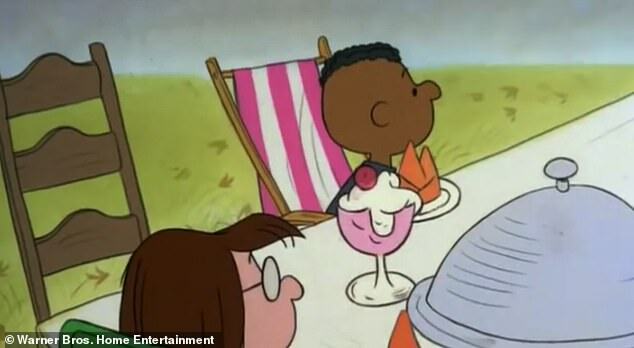 Another point made by fans was that Franklin had been given a different chair to his friends, as he was sat on a lawn chair rather than a dining chair. Some viewers appeared to be watching the annual episode for the first time, while others seemed to have only just noticed that Franklin was seated by himself. A third demanded that they changed the show to seat some of Franklin's friends alongside him or he would no longer watch the holiday classic. However many were quick to defend the program, highlighting that the show's creator Charles M. Schulz fought to get Franklin into the cartoon. Another dubbed the accusation of racism a 'joke', adding: 'Man, I was just watching this today and I thought, "I wonder why people haven't attributed racism to Franklin having the crappy chair at the Thanksgiving table.' And here it is. What a joke." The episode first aired on November 20 in 1973 on CBS up until 2000 before it moved to ABC in 2001 and still airs annually. Franklin was first added into the show by Schultz when a teacher wrote to him and asked for a black child to be included into his cartoon. Harriet Glickman assured Schultz that something as small as him writing a child of color into his work as the friend of a white child could make a radical impact. Although Schultz worried that people would consider the new addition as tokenism, however Glickman had a solution for this as well. She asked her friends to write to Schultz and persuade him that the accusation of being patronizing is a small price to pay for the difference he could make. Years after Franklin was first added into his comic strip, Schultz said that his editor was against the idea, however he told him, 'Well, Larry, let's put it this way: Either you print it just the way I draw it or I quit. How's that?' So that's the way that ended.